Ospf and Eigrp are without doubt, two of the best internal routing protocols out there. Not only do they support VLSM and manual route summarization, they both keep backup routes with ospf going the extreme by keeping all available routes to a destination. Having both routing protocols running on your network can be awesome when carefully implemented. 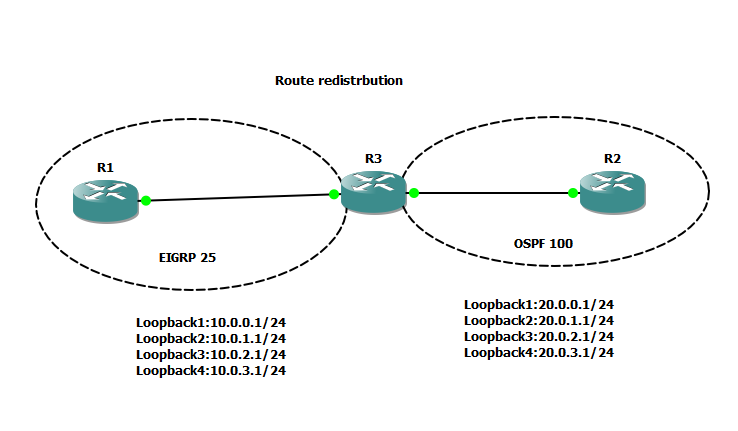 In this post, I will share with us, using gns3, on how to redistribute between ospf and eigrp. 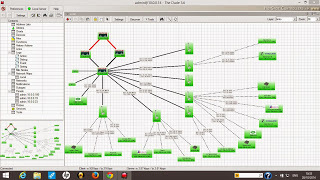 Assuming you are already running an eigrp network and your company has recently acquired another company running an ospf network, your task is to successfully integrate the newly acquired company’s network into your existing setup, making sure that there is full connectivity between users. To accomplish this, you can run eigrp on the newly acquired network and have the subnets advertised to your network. But what if the routers are not Cisco routers? In that case, you can successfully share routes between routers running different routing protocols using redistribution. From our topology, router 1 is running eigrp for autonomous system 25 while router 2 is running ospf with process ID 100. Our objective is to achieve full connectivity between R1 and R2. Without redistribution, hosts on both routers will be unable to communicate. 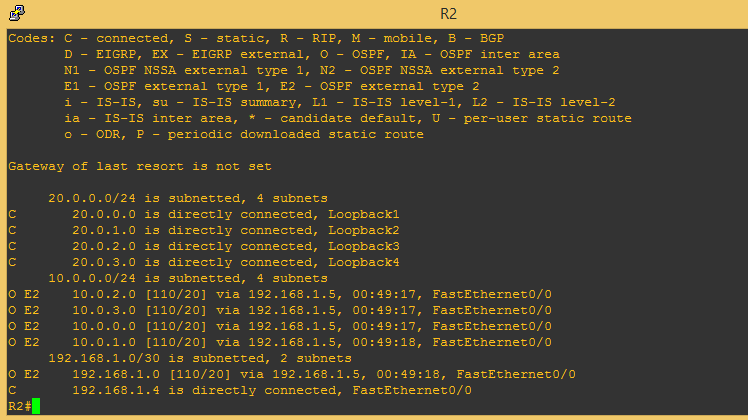 On router 3, which is the border router, is where the redistribution will be configure. 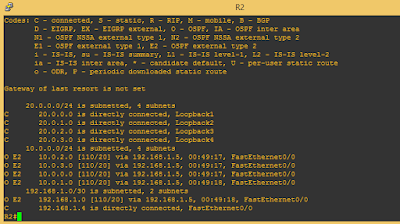 R3 will run both EIGR 25 and Ospf 100. At this point, R3 has routes from both R1 and R2 but R1 has no knowledge of the routes from R2 and vise versa. 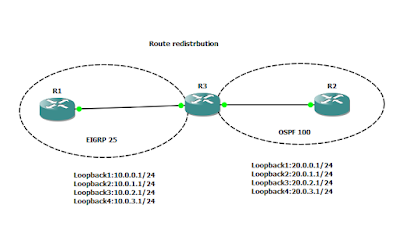 To achieve full connectivity, we need to configure redistribution on R3, first from eigrp to ospf. Then, from ospf to eigrp. WAN: implementing frame-relay point to point on Cisco routers, from start to finish. ← Rogue dhcp: what it is and how to stop it on your network using dhcp snooping. It was neat and described well!